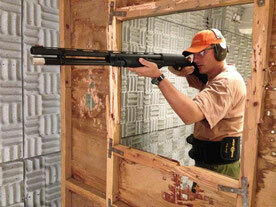 Practical shotgun involves shooting ground based targets at speed and in differing firing positions. The skill is to engage targets quickly and accurately and to keep loading those shells even when you are on the move. Ranges are between five and 25+ yards. A section 2 shotgun (you can normally borrow one from one of our members) is fine to start off with but in the long term you'll need a Section 1 to be competitive. Ammunition ranges from bird to buck and (on select ranges) slug. Safety is paramount. 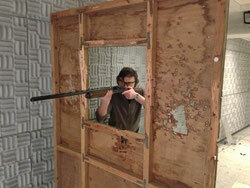 Eye and ear protection must always be worn. A fully qualified Range Conducting Officer, NRA Coach and First Aider will be at all of our Practical Shotgun shoots. We are fortunate here at OWRPC that we have our own indoor range at the club where we have a monthly practical shotgun session. We also travel to other ranges and clubs. All full and probationary OWRPC members are welcome.